At the start of a project there are many different objectives and everyone involved has their own sense of priorities or tasks they wish to a tackle first. For me that is generally sorting the backend into a nicely organised structure that will allow flexibility in the output both now and in the future. A big part of this is getting real data in so the front end output is as close to final content as possible. This allows us to realistically analysis how the content and design will work together. As flexible as the web is with it’s layouts there are still times when a design will only allow a certain amount of text or number of items to appear before it looks squeezed. For example text in a sidebar can be excellent if it’s short and snappy. However if the actual content is a long paragraph it will be very hard to read. I’ve also experienced this with titles where they can be in a large font size. Taking into consideration how that works over multiple lines is a useful exercise. 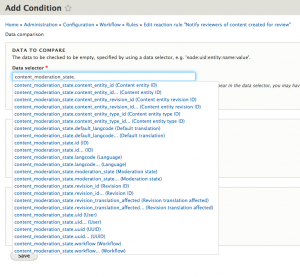 Adding columns or boxes to a layout is a useful way of defining content areas. Without real data these areas normally contain filler text, occasionally the same filler text, which can mean boxes are the same height as each other. On many occasions I’ve seen a design change as soon as real content is output as one boxes contains many more lines than the other causing them to no longer vertical match in height. This is normally the realm of imagery as it is the hardest part of content to populate. Instead of just using test images take the time to ensure the design works with other no images or a placeholder repeated multiple times. 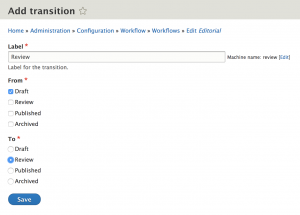 Content editors often need to add some classes or styles to text entered in wysiwyg editors to help front end presentation. By their nature these editors don’t or can’t always output perfect markup. By using them to populate the site at design and development time you can save a lot of headaches by utilising the markup they do produce and not battling against it. On every project I find the use of real data and content smooths out the development process as all involved parties can see a “real world” example of how the site will function with it’s content. 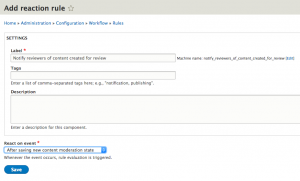 In my previous post I talked through setting up Content Moderation with a review state. 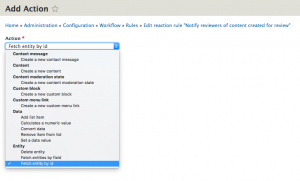 In this post we will complete the process by sending email notifications via the Rules module when the moderation state is changed. 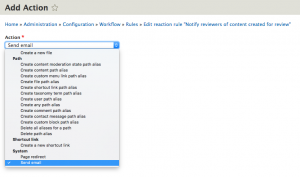 Once this has run you can return to the Extend page and enable the Rules module. By the end we will have three rules for different states and transitions. The first rule will handle the creation of content the state is set straight to Review. Once on that page click on the Add a reaction rule button. Fill in the details with the following. We now need to add a condition so click the Add condition button. 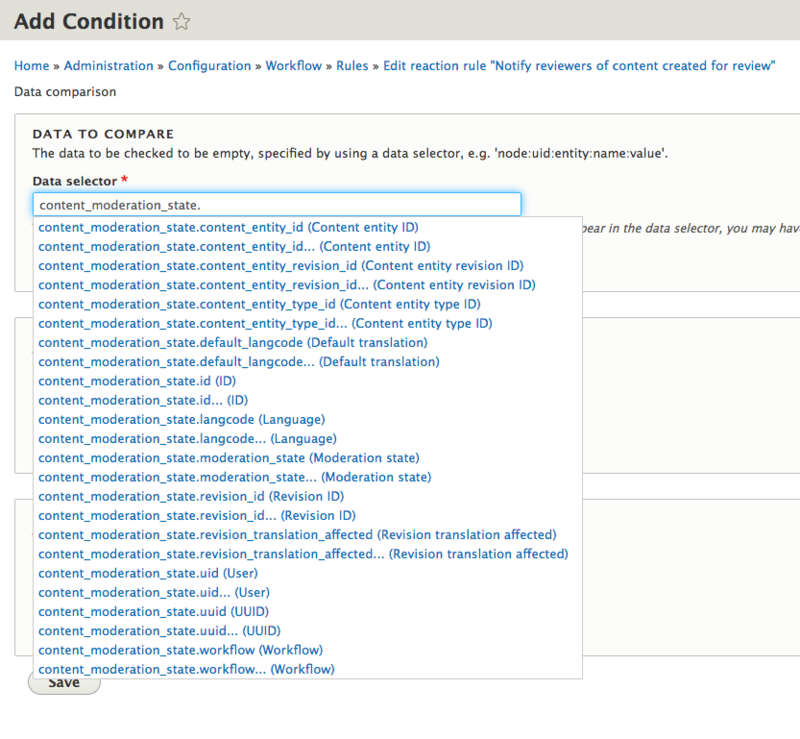 When adding our condition it is useful to Switch to data selection for the Data selector input. This will help us drill down into the available data. Set the Data value to review. This is the machine name of our state that was created in the Editorial Workflow. We can now save our condition. Before we create our action to send the email we need to make the node available to our rule so we can use it’s title and ID in the email body. 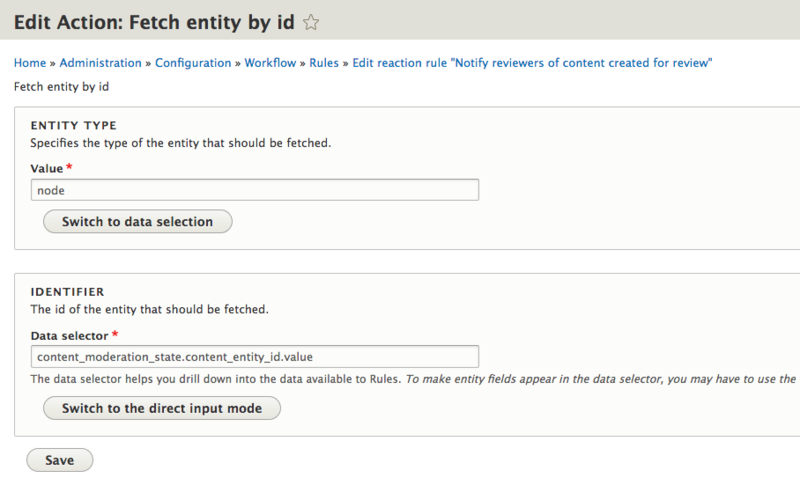 Click Add action and then choose Fetch entity by id under the Entity section. On the next screen set the Entity Type value to node and then for the Identifier we will again switch to data selection. We can now add an action for sending the email. Click the Add action button and choose Send email from the System section of the dropdown. For the Subject we use Item Ready For Review. The two parts in curly brackets are tokens from our fetched entity, node, that we performed earlier. 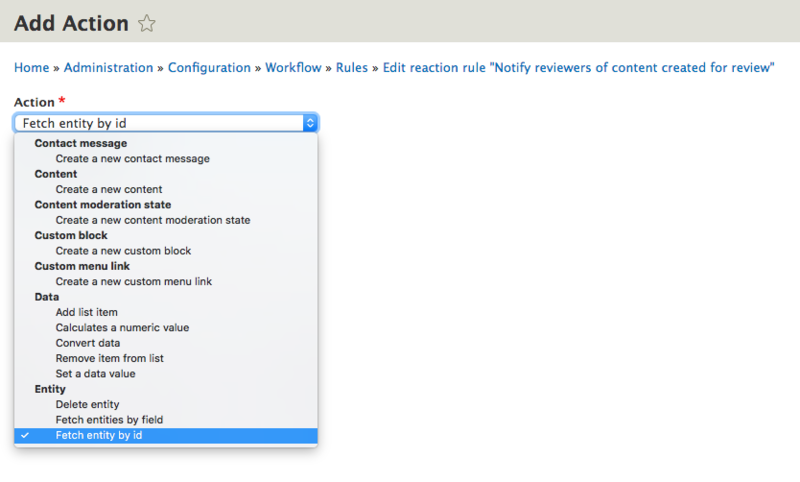 In the next part we will create two more rules to handle updating the moderation state. 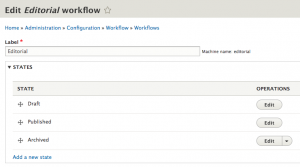 For Drupal projects I’ve always used the comprehensive suite of tools provided by Workbench. But when I started a new project and saw that Workflow is hopefully making it’s way into core it felt like a good time to try it out. 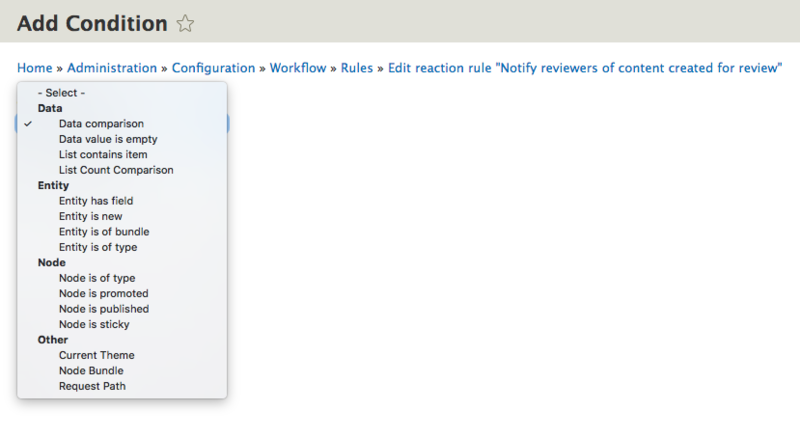 One part of the project was the addition of notifications when Workflow states were changed. With the Rules module also receiving lots of attention I decided combining the two modules was the best approach. First of all we have to enable the Workflows module and the Content Moderation module. 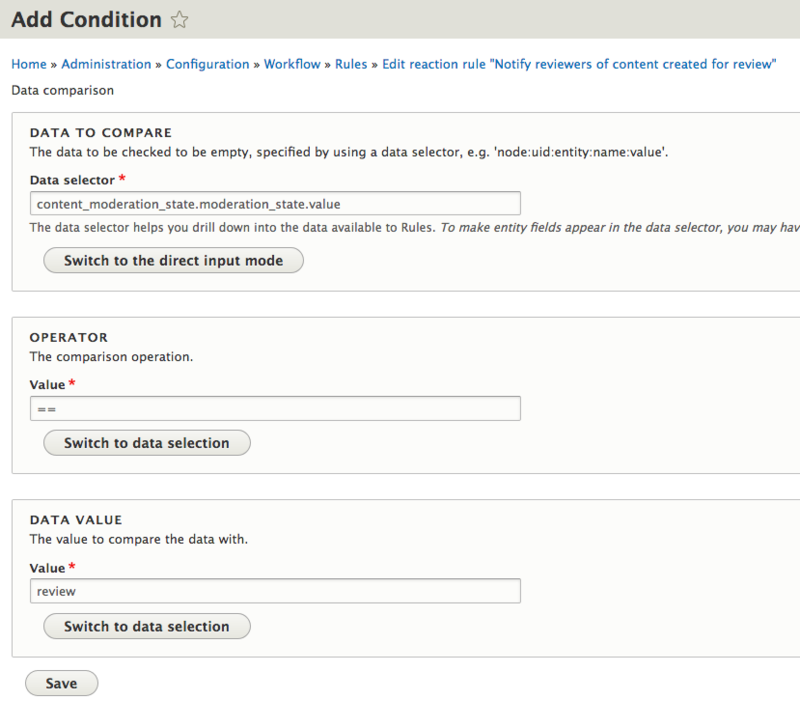 Click on Extend form the admin menu or go to /admin/modules and find these two modules. 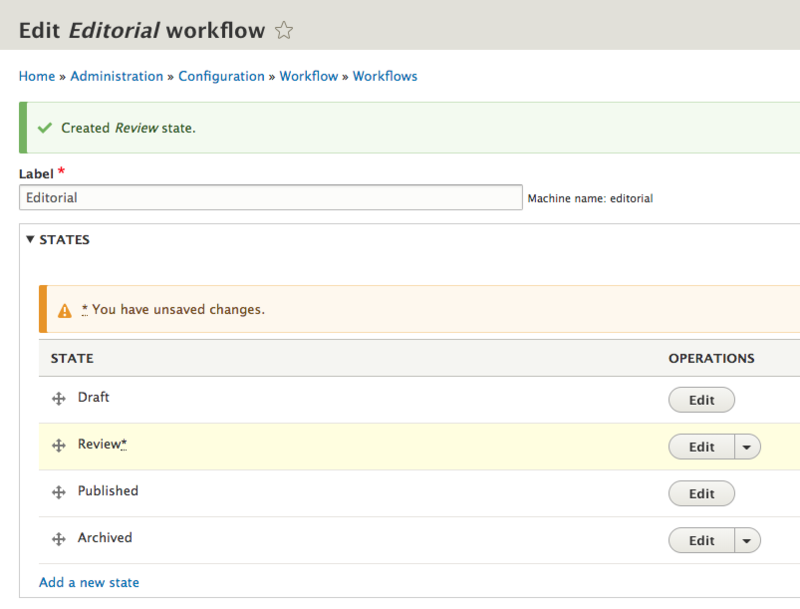 If you go to /admin/config/workflow/workflows you will see we have one workflow called Editorial. We currently have three states but we want to add a new one for Review. Click the Add a new state link. On the Add state page all we need to enter is a label of Review and then click Save. Back on the Edit Editorial Workflow page drag the Review state to in between Draft and Published and then click the Save button at the bottom of the page. We now need to edit the transitions to allow the flow between draft, review and publish. This is how the transitions look by default. We need to enable a draft to be become a review and a review to become published. We want to cut out the draft to published transition. 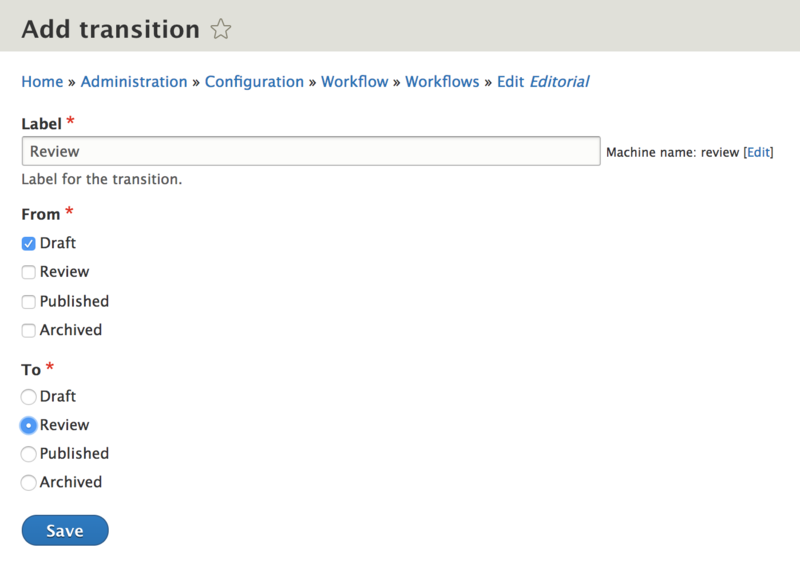 Below are the default transitions, we’ll first add our new ones and then modify the existing ones. Click the Add a new transition link and you will be on a page with options for Label, From and To. Set the Label to Review, From to Draft and To as Review then click Save. Back on the main page drag the new Review transition up so it is between Create New Draft and Publish and then click Save. We now need to update the existing transitions. Change the Create New Draft From value. It is currently Draft, Published and we need it to be Draft, Review. Lastly for transitions change the Publish transitions’s From value to Review, Publish. This means a node has to go from Draft to Review before it can be published. 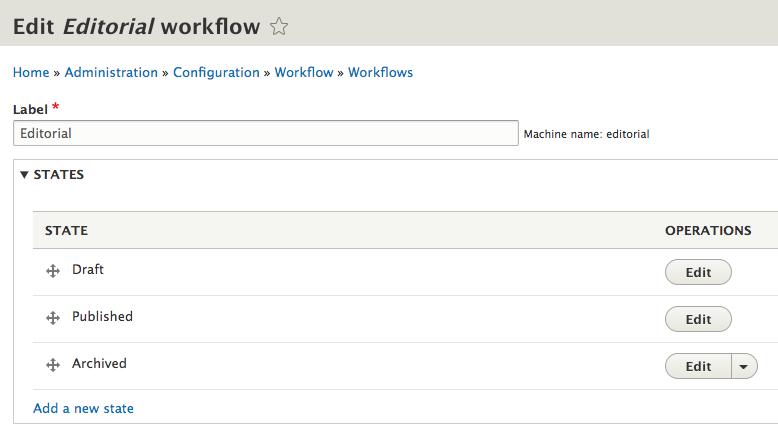 The last part of the workflow setup is to enable it for any required content types or entities. 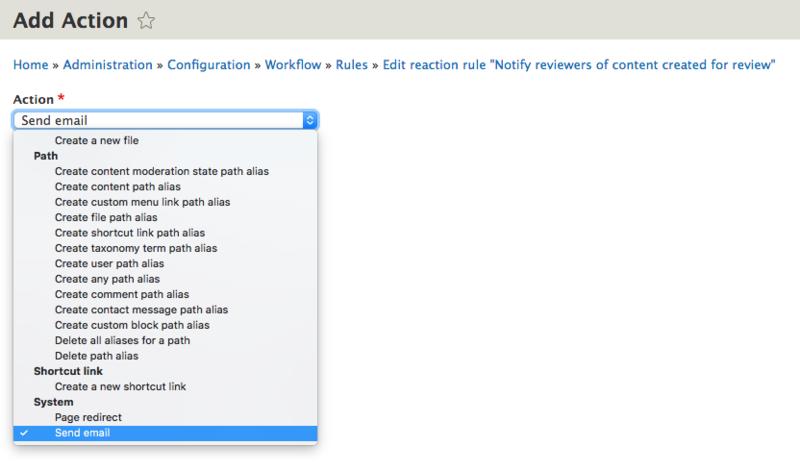 At the bottom of the page there is the section This Workflow Applies To. 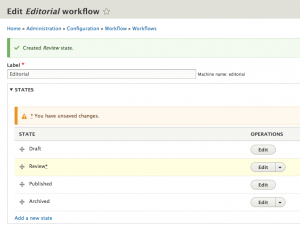 In this example we will enable this workflow for Basic Pages. Click the Select button beside Content types, select Basic Page from the overlay and then click Save. Now If you go to add a Basic Page you will see at the bottom there is a select where you can choose the State of you node. 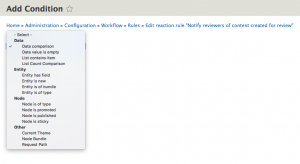 In the next part we will look at sending email notifications when the Workflow state changes using the Rules module. 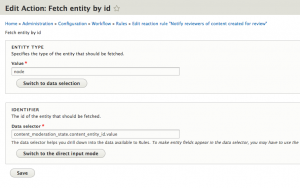 To achieve this you will need to implement hook_views_query_alter() in a custom module. I did not do this in Views UI. A recent project at Headscape required me to build view listing two different content types that would use two different date fields to sort by. 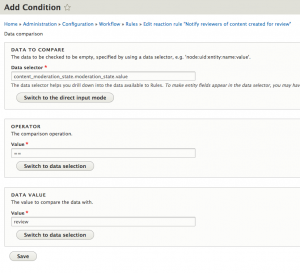 For examples I’ll use the default basic page and article content types. Some content types need to be sorted on the node created date and others on the display date field. Trying to use the Views UI to add the two sort fields would result in first ordering by node created, then ordering by display date which is not the result we were after. First we need to add a new field that we can sort by. This field will have the alias order_date. To create it we check if the display date field is null, if it is order_date gets the node created timestamp. If display date has a value we convert it to a Unix timestamp and that value is assigned to order_date. Next we need to add the order by clause. As this is the only field we want to order by we completley over write the order by array. Put together hook_views_query_alter will look like this. 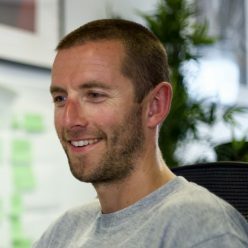 I’ve been using ReactJS as I have been exploring Headless / Decoupled Drupal and have so far found it to be very nice to work with. However, as I am not overly familar with it I’ve found myself looking up lots of things to ensure I’m doing it “the React way”. This has meant I’ve been doing more React learning than I have Drupal learning. My solution is to go back to an existing Drupal 7 project where I have a custom piece of search functionality and replicate it using JSON feeds provided by Drupal and a ReactJS frontend. This has been really beneficial in my learning as I have very clea objectivies and expectations. It also means I am only focussed on learning one thing at time so I don’t skip around between documentation and tutorials.